Image: Dan Charity - WPA Pool/Getty Images. The audience at London’s Victoria Palace Theatre got a one-of-a-kind mini-encore performance on Wednesday night — and, fair warning, you’re gonna wish you hadn’t missed it. 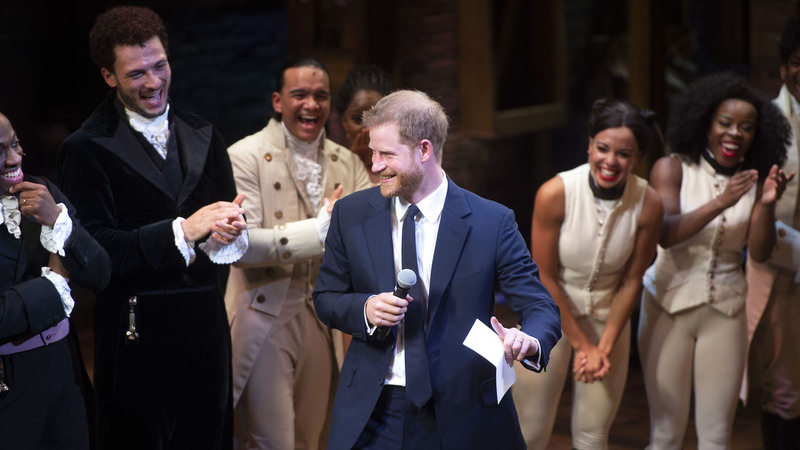 After enjoying the production of Hamilton, Prince Harry took the stage and showed off his acting chops. Granted, Harry isn’t likely to trade it all in and join an acting troupe anytime soon. The Duke of Sussex only belted out a few notes, singing the first two words of “You’ll Be Back.” In the play, the piece is sung by the character of King George III. And while Hamilton boasts many famous fans, Miranda admitted this one was special. “We’ve had some popular folks come see our show but you don’t often get a direct descendant of one of your main characters. That’s very exciting and I’m very curious to see their reception,” he said. While Harry and new wife Duchess Meghan (née Markle) of Sussex are undoubtedly patrons of the arts, this wasn’t just a run-of-the-mill night at the theater. Rather, it was a charity performance to raise money for Harry’s charity Sentebale, which supports the mental health and well-being of young people affected by HIV. A worthy cause, and one that was also important to Harry's late mother, Princess Diana. All told, the evening raised an impressive $390,000 for Sentable. Maybe the next charity performance will see Meghan take the stage too. After all, we already know she's got the acting down. And even though she left that career behind for royal life, certainly no one would mind if she trots it out for a good cause occasionally, right?